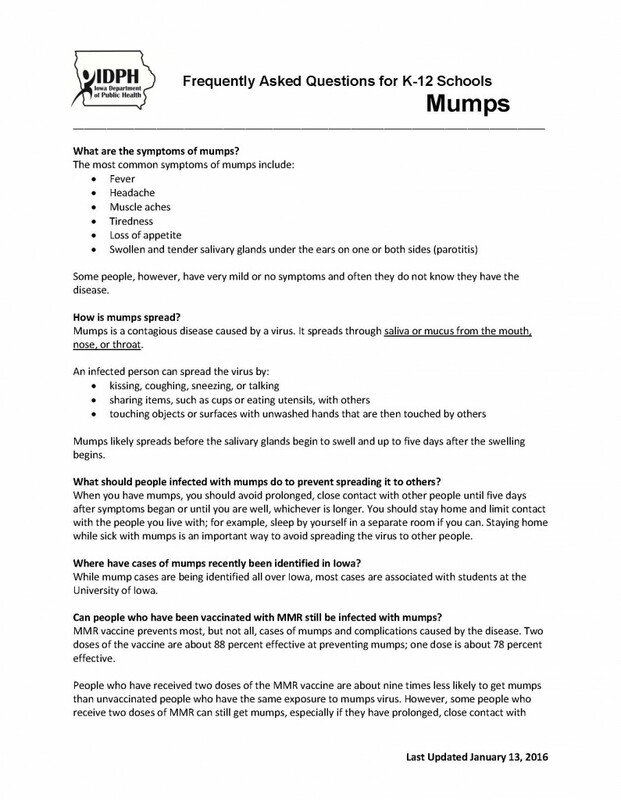 As you are aware, there has been a lot of information in the news regarding mumps. It is important to know that the Muscatine Community School District works collaboratively with UnityPoint Public Health and local medical providers in making sure that students who are ill or exhibiting symptoms are referred to their medical provider for prompt evaluation and follow-up. 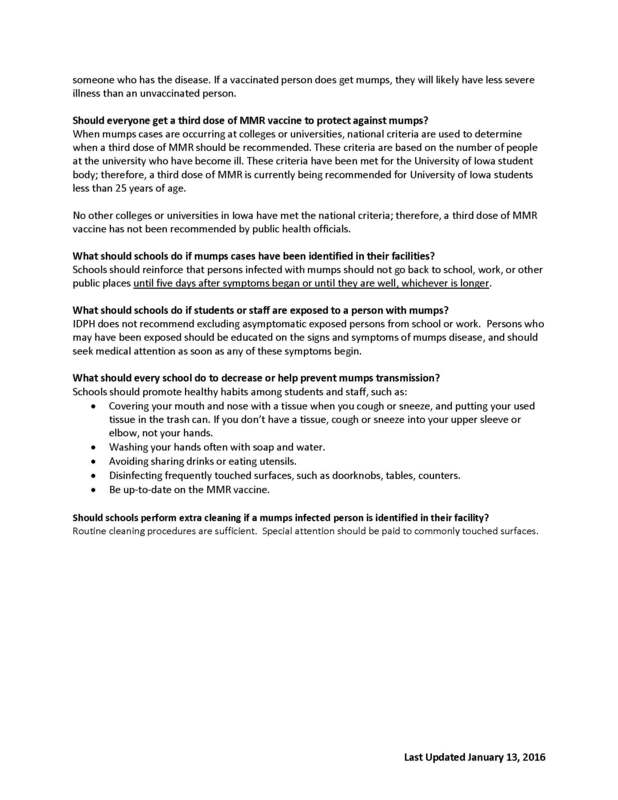 Recently, the Iowa Department of Public Health has updated their information regarding mumps and the school district would like to share this information with our parents. It is important to know the what to look for (signs and symptoms) and when to keep your child home from school to reduce the risk of transmission to others. Mumps is a disease caused by virus. Mumps is spread through saliva or mucous from the mouth, nose and throat. A person with mumps can spread this virus by kissing, coughing, sneezing, or sharing items such as cups and eating utensils with others. Common symptoms of mumps include fever, headache, muscle aches, tiredness, loss of appetite and swollen tender salivary glands under the ears on one or both sides. It is important to note that mumps likely spreads before the salivary glands begin to swell and up to five days after the swelling begins. There is no medication to take once diagnosed and it is important to stay home during this time to avoid spreading the virus to others. If your child has had the MMR vaccine series, this will prevent most but not all cases of mumps. Furthermore, if a child with proper MMR does become infected with mumps, they may have a more mild case. If you have any questions, please contact your family medical provider. You can also contact your child’s school nurse or UnityPoint Public Health at 263-0122.